RCMP officers watch on as a group of pipeline protesters block the entrance to a Kinder Morgan terminal in Burnaby, B.C. Mounties arrested five protesters at a demonstration in Burnaby, B.C. Monday where a group of doctors gathered to voice their opposition to the Trans Mountain expansion project. The doctors addressed a crowd of pipeline protesters outside Kinder Morgan's Marine Westridge Terminal, sharing their concerns about the potential for a devastating oil spill, as well as the consequences of continued reliance on fossil fuels. Dr. Tim Takaro pointed to the forest fires raging across B.C. as an ongoing symptom of climate change that will only get worse as times goes on. "I have children and I'm a public health physician, it's my job to stand in the way of projects like this that run contrary to public health," Takaro said. "We know these increased warming trends are giving us much higher risks of fire in our forests, and even in our temperate rainforests that (previously) were really too wet to burn." Takaro was joined by other doctors, including Dr. Peter Pare, an expert on respiratory medicine at UBC and St. Paul's Hospital who warned about the health impacts of the wildfire smoke. “I'm here because I think this project represents an enormous public health risk, to the air and to the water, both locally and globally,” Pare said in a statement distributed by protest group Protect the Inlet. "We're sitting here in the smoke, we can hardly see the sun." Doctors also questioned how the federal government intended to meet its Paris climate agreement commitments in spite of the controversial pipeline expansion, which would nearly triple the amount of diluted tar sands bitumen being shipped to the west coast. The protesters who were arrested were blocking access to Kinder Morgan's terminal in violation of a court injunction, according to the RCMP. Authorities said the protesters were handed copies of the injunction and given a chance to leave without being taken into custody, but refused. 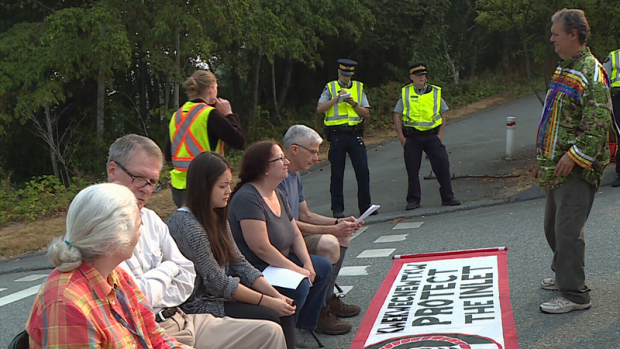 Protest group Protect the Inlet identified the arrestees as 24-year-old Kira McLean, 68-year-old Jim Fidler, 57-year-old Brenda Morrice, 64-year-old Cynthia Nugent and 73-year-old David Gooderham. All have been released from custody on a promise to appear in court. More than 200 people have been arrested in connection with anti-Kinder Morgan demonstrations since March, and a number have been sentenced to short jail terms.